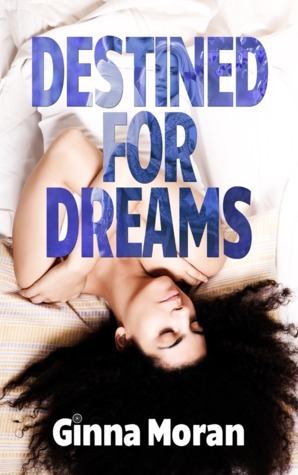 Destined for Dreams – Ginna Moran—Author of Young Adult Paranormal, Fantasy, Contemporary, and..,Your Next Book Boyfriend. Today, as a treat, I’d like to introduce you to two special guests for an interview—the ones who told me their story in the first place—Nadia Petrov and Hunter Sullivan. Me: It’s great you two could join me today for this interview. Nadia: I’m trying to make up for the time I gave you a nightmare. Me: He’s right. I doubt you invade unsuspecting sleepers’ dreams anymore since you met Hunter. Me: Probably for the best. So, why don’t I just ask the first question? Me: You two met in a dream. What was that like? Hunter: Indescribable. I couldn’t believe she was real and in Jackie’s head. Nadia: Hunter was quite the surprise. It scared me at first, but I felt bad for him, so I kept going back. Hunter: I’m lucky she did. Me: I think all of you were lucky. What do you think your lives would be like if you didn’t meet? Nadia: We’d both be trapped in places we hated. Hunter: Yeah, I doubt Jackie would’ve been courageous enough to face her fears alone. Me: What did you miss the most being imprisoned in someone else’s body, Hunter? Hunter: Basically everything, but I missed being in control…and food. Oh, and kissing. Nadia: The real thing is definitely better than in dreams. Me: Hah! Nice. Do you hold a grudge against Jacqueline for taking your soul as collateral, Hunter? Hunter: While it was torturous being in Jackie’s mind, I’ve learned a lot from her. Yeah, I’d never ask to share a body again, but if I hadn’t, I would’ve never met Nadia. Me: What about you, Nadia, any resentment toward Jacqueline? Nadia: No, definitely not. Jacqueline and I are a lot alike. We’re burdened with gifts we don’t really want. In her defense, she did it to save herself. I might’ve done the same. Hunter: My mom would’ve killed her. Still might try if she ever finds her. Hunter: It’s manageable. We’re working things out. It’s a lot easier being with Nadia in the real world instead of a dream. Me: Speaking of dreams, what do you like about dreams, Nadia? Nadia: I get to see and go places I don’t get to visit in real life—some of those places don’t even exist in the real world. It’s like being a part of a magical place…until I destroy it, at least. Me: Can you visit without inflicting a nightmare? Nadia: No…I don’t think so. I’ve never tried, really. It’s too irresistible. I don’t do it for fun. It wouldn’t be right. Hunter: She could invade my dreams anytime. Me: So what has been your favorite dream? Hunter: Mine was the very first one I met Nadia, in the rundown city. It was the first time I felt hope since being trapped in Jackie’s mind. I sometimes try to imagine that place so I’d dream about it on my own. Me: Has it ever worked? Hunter: It’s not the same without Nadia. Me: So what about you, Nadia? Nadia: I loved most of the dreams I’ve invaded with Hunter, but my favorite is the one and only dream I had on my own. It was such an amazing and scary feeling not having the same control I do when inflicting a nightmare, but I felt so normal. Almost human. I’d love to dream again. Me: Okay, last question. What’s next for you two? Hunter: I’ve made some plans with Jackie. We’re going to change the world so we don’t have to worry about the Human Preservation Agency. Nadia: I’d like to find some sort of normalcy…and figure out how to tell my father about Hunter. Me: Dmitri is quite intimidating. Hunter: Tell me about it. Nadia: He’s really a softy. Me: Well, it was great having you both here. Maybe next time you could convince Jacqueline to join you. Hunter: If it suits her. Nadia: Don’t listen to him. Of course she’d love to come. Thanks for reading Nadia and Hunter’s character interview! Are there other characters you’d like an interview from or other questions you’d like to ask Hunter and Nadia? Let me know in the comments! Pick up Destined for Dreams for FREE at Amazon, Barnes&Noble, iTunes, and Smashwords. I’m so excited and grateful for all the positive responses to Destined for Dreams so far. It’s always nerve-wracking to hear whether or not people like your work, and I appreciate all my readers and their kindness. Today’s post will feature one of my favorite characters, Jacqueline Matthews, and how I created her. When I originally thought of Jacqueline, she was supposed to be a true monster. But as I started writing, Jacqueline had so many more layers to her than I realized, and her struggle with her own personal demons was close to the same struggles as Nadia, that making Jacqueline truly evil was impossible. Jacqueline’s even more of an outsider than Nadia. She had lost all of her family and had no friends because she was constantly on the run. Jacqueline is guarded and resourceful, and because she spent her life before taking Hunter taking care of only herself, she was selfish due to her circumstances—it was all she knew. Because of that, Jacqueline Matthews’s character changes the most throughout Destined for Dreams and the rest of the series, and I hope you enjoy her journey as much as I enjoyed writing it. Now without giving away too much, below is Jacqueline Matthews’s character bio. Ability/Creature: Sin-eater—she purifies the wrong-doings of bad souls so they can die in peace. Fears: As we see in Jacqueline’s nightmares, her greatest fear is the Human Preservation Agency. Strengths: Jacqueline is resourceful, manipulative, and selfish. It’s her sheer will to survive and her self-centered tendencies that keep her alive. I hope you enjoyed this look into Jacqueline Matthews. Watch out for Hunter’s Curse: A Destined for Dreams Short Story. It’s a prequel to the novel and features Jacqueline Matthews and Hunter Sullivan. Coming soon! With less than a week until the release of my debut novel, Destined for Dreams, I’d like to celebrate with a giveaway through www.goodreads.com. So from now until Dec 8, 2014, enter to win a free *signed* paperback copy of Destined for Dreams. All you have to do is hit enter to win on the widget below. Good luck! Giveaway ends December 08, 2014. I’m very excited to announce that my debut novel, Destined for Dreams, is now available for pre-order. In the beginning of 2014, I was researching different mythical creatures and stumbled across folklore on a creature called a Mare, also known as Mara or a Nightmare. I couldn’t stop thinking about this creature and what it would be like to survive by invading people’s dreams to turn them into nightmares—and that’s when the story of Nadia Petrov, a nightmare inflictor, was created. After some plotting, I thought that Destined for Dreams would be written from only Nadia’s point of view, but when I started writing a particular scene where Nadia’s inflicting a nightmare, a new character took me by surprise. The character was loud and demanding, and wanted to share his story, and what a troubling story he had. So, I went back to the beginning of my book and Hunter Sullivan got what he wanted—his own point of view. Destined for Dreams is a young adult paranormal romance with alternating points of view and will be released in print and eBook on December 1, 2014. I hope you’re looking forward to the release of Destined for Dreams as much as I am. Stay tuned for quotes, short passages, and maybe even a few giveaways.